Great photo, Joe! I’ve seen those planting felt bags in stores, but never put to use in such a way. Fascinating. Thank you Kathy 🙂 I’ll do my best to get back there as the season progresses to get another shot. That is an incredible garden! Very cool – a garden that is a work of art. Great find and photo Joe. What a wonderful idea, and a great use of space. What a wonderful use of space as a garden, and what a great photograph of it. Thanks for this blog. Best wishes and blessings, Charles. Pleasure, love gardens and gardening, and to have a great photo of it, what more could I want. Enjoy the weekend. i looked at the other 3 blogs as well, and liked what I saw, so am following them too. Charles. Wow what an awesome idea! 🙂 Great photo Joe! Super creative planters. You captured the essence of Ben’s creation so vividly. Nicely framed image, too. 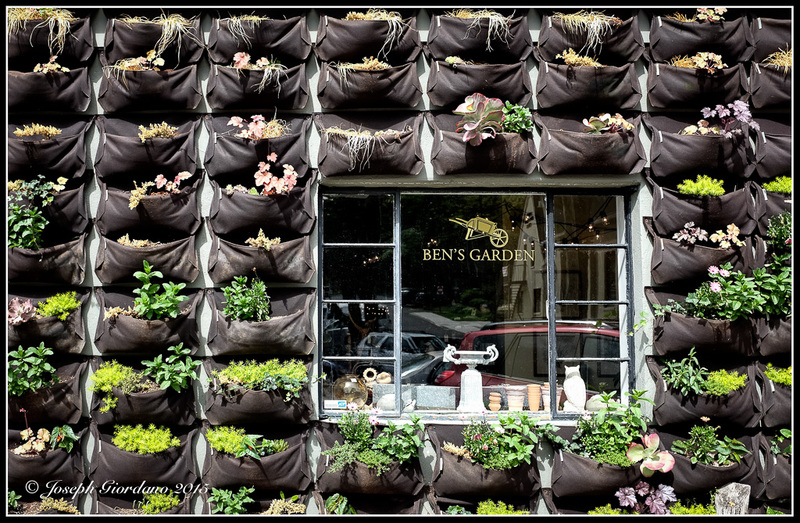 How fantastic and what a great expansion of the window-box garden! At this time a bit of an eyesore, but in few weeks glorious to the eye. Actually I took this about one month ago Stephen so now I will have to go back and see how it filled in 😀 Thank you.